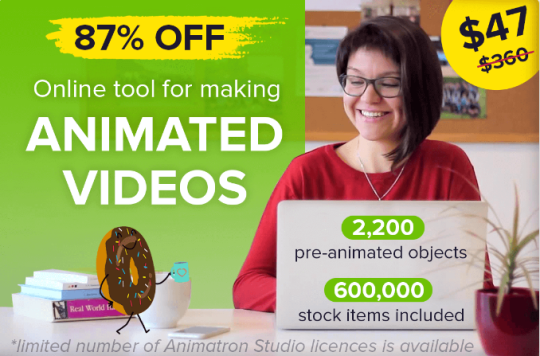 This week`s deal is Animatron, a tool that makes it easy to create animated videos and slideshows for fun, engaging content! > Normally, a year’s subscription is $360. We’re offering it for $47. Customers love video. The above video says people are 64% more likely to buy a product after watching a video, and that seems right. With Animatron, you don’t need to be a professional videographer or animator to make quality video content. Providing you with pre-animated elements, stock objects, transitions, and effects, Animatron makes it easy to transform your photos and footage into neato-keen promotional material! Typically, a subscription to Animatron costs $30 a month. For a limited time, you get a full year’s subscription for only $47, or just over the cost of a month and a half. That’s 87% off! At this price, give it a shot. Once you find out how fun and easy it is to produce professional video content, you’ll start finding excuses to make more everywhere!